Congratulations to Geffrey Klein, Event #10 Champion ($544,388)! That's it, folks! 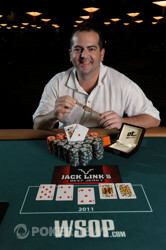 Another gold bracelet event at the 2011 World Series of Poker is in the books after a long day of play today. Walking away with the title to Event #10: $1,500 No-Limit Hold'em / Six Handed is gynecologist Geffrey Klein from Houston, Texas. He'll bank $544,388 for his finish and the coveted WSOP gold bracelet. The day began with 15 players returning to action. It eventually came down to just two, Geffrey Klein and Eddie Blumenthal. If Blumenthal's name sounds familiar, it's because he's coming off a fourth-place finish in Event #4: $5,000 No-Limit Hold'em earlier in the WSOP. When play got down to heads up, Blumenthal held nearly all of the chips in play. Klein had just 775,000 chips to his name while Blumenthal held the rest. Nevertheless, Klein battled his way to a couple double ups and eventually took the lead in the match. From there, he kept constant pressure on Blumenthal and seemed to win every pivotal pot in the match. When the final hand came up just about 20 minutes before the two would be forced to stop for the night due to the 10-Level Rule, it was a classic race situation with the money going in preflop. Klein's defeated the pocket sevens of Blumenthal to take the victory and etch his name in the poker history books. Blumenthal's run is nothing short of amazing as he's now made two final tables this WSOP in tough events with large fields. He earned $334,756 for his runner-up finish. That concludes PokerNews' coverage of this event, but we've got plenty of live reporting going on around the clock to keep you occupied. 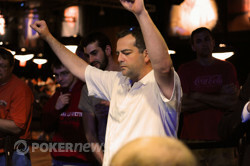 Be sure to keep your browser locked to PokerNews for all of your official 2011 WSOP updates! Just when we thought we were coming back tomorrow to wrap this one up, the cry of "All in, call" just went up from this final table for the last time and we have now crowned our champion! Eddie Blumenthal raised to 250,000 from the button and Geffrey Klein quickly reraised from the big blind. Blumenthal snap-shoved and Klein beat him into the pot. The crowd pushed and shoved to get the best view as the dealer burned and prepared the flop. The flop of improved neither hand, but to Blumenthal's disgust, the appeared on the turn to give Klein the nut flush. Down to just two outs, Blumenthal almost lost it when the appeared on the river. "How can he beat me in that many all-ins, Jesus Christ!" he hissed loudly. His friends tried to console him, but Blumenthal pushed them aside and stormed out of the Amazon Room. Understandably, the cards didn't fall his way tonight, but it wasn't the most sportsmanlike end to the tournament. Still, Blumenthal will have 334,756 reasons to smile once the dust settles. And now - it's time to wrap this one up. 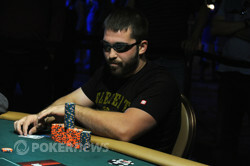 Congratulations to Geffrey Kline, your newest WSOP champion of 2011! Eddie Blumenthal raised to 250,000 from the button and Geffrey Klein called from the big blind. The dealer placed the flop in the middle and Klein checked. Blumenthal bet 260,000 and Klein made the call. After the landed on the turn, Klein checked again to his opponent. Blumenthal fired 600,000, but was met with resistance in the form of a check-raise all in from Klein. Blumenthal looked back at his hand and then tossed them into the muck. The tenth event of the 2011 WSOP was oh so close to being over, but it proved to be a false alarm in the end, much to the embarrassment of Geffrey Klein. Eddie Blumenthal raised to 200,000 from the button; Klein reraised to 550,000 and Blumenthal four-bet shoved for the rest of his chips. Klein asked for a count - it was 3.43 million, to be exact - and after contemplating for almost a minute, Klein made the crying call, but found himself ahead. Klein thought he had won it and started high-fiving and hugging his friends on the rail, but tournament supervisor Bob Smith had to break the news to him over the PA. "Sorry guys, it's a chop," he said. Suffice it to say, Klein looked a little sheepish as he sat back down. And with that, heads-up play continues! Eddie Blumenthal raised to 225,000 from the button and Geffrey Klein called from the big blind to see a flop of , but check-folded to Blumenthal's bet of 205,000. Then in the next hand, Blumenthal completed from the button, only to see Klein raise to 250,000. Blumenthal called, but folded after Klein led out for 260,000 on the flop of . We've also just found Elvis Presley here in the Rio - he's been moonlighting as a poker dealer all these years. After a limped pot preflop, Eddie Blumenthal check-called Geffrey Klein's bet of 125,000 on the flop of before both players checked the turn of the . On the river of the , Blumenthal opened for 220,000 and Klein laid his hand down. In the very next hand, Blumenthal raised to 225,000 and Klein called, only to check-fold after Blumenthal's bet of 280,000 on the flop of .